What’s the Difference Extra Virgin and Fractionated Coconut Oil? Annmarie Skin Care > Organic Skin Care Ingredients > What’s the Difference Between Extra Virgin and Fractionated Coconut Oil? We love our coconut oil. Rich in vitamins, antioxidants, and penetrating fatty acids, it’s one of the most hydrating and plumping oils we can use. That’s why we have it in five of our products, including both our Herbal Facial Oils, our Coconut Honey Mask, and our Coconut Body & Face Oil. If you look closely at the ingredient list, though, you may have noticed that not all of these coconut oils are the same. In our Coconut Body Oil and Coconut Honey Mask, we use extra virgin coconut oil. In both our Herbal Facial Oils, we use fractionated coconut oil. We imagine some of our more curious customers may be wondering why we have two kinds. Here’s your answer! Manufacturers apply heat to the source material, which separates the oil over time. Picture olives piled in the sun, or palm fruits boiled in water, after which the oil is skimmed from the surface. The nuts or fruits are ground or rolled up, and then washed with a chemical solution that releases the oil. These processes usually include heat as well, as the oil is heated to separate it from the chemical solution. A mechanical press actually presses the oil out of the source material. The result is thought to be purer and less contaminated than that which results from other types of extraction. Unrefined: The oil is filtered to remove large particles, but is subject to no additional refining. Refined: The oil is exposed to chemicals, heat, or other materials to remove impurities. What is Extra Virgin Oil? For our products, we prefer as little processing as possible, as we want an oil that’s as close to the original source material as we can get. Oils labeled “virgin” or “extra virgin” are typically unrefined, meaning they haven’t been exposed to chemicals that can potentially linger behind to get on your skin, or that may damage some of the natural components of the oil. Why extra virgin over refined? To be clear: Refined oils aren’t necessarily exposed to chemicals—some may be treated with only heat or clays to filter and purify the oil. But on the whole, virgin oils are the least processed of all available oils, maintain more of the natural components, and usually test higher for things like antioxidants and nutrients. In a 2009 study, for example, researchers compared the antioxidant capacity of virgin coconut oil with oil that had been refined, bleached, and deodorized. They found that the virgin coconut oil had a higher antioxidant capacity than oil that had been significantly processed. One thing about extra virgin coconut oil: it’s solid at room temperature. That’s why we warn you that our Coconut Body & Face Oil may solidify at cooler temperatures, and why our Coconut Honey Mask is more like butter than cream. It’s easy to soften it—a few minutes in hot water or warmed between your hands or fingers will do the trick. Mix well with the other oils in the product. Easily and quickly penetrate the skin. The extra virgin oil, because of its natural composition, doesn’t fit the bill. Since coconut oil is such a superior moisturizer, we didn’t want to leave it out of our facial oil formulas. So we needed an alternative. Fractionated coconut oil, also called “liquid coconut oil,” fit our requirements. Basically, it is a form of the oil that has had the long-chain fatty acids removed via hydrolysis and steam distillation. Just this one change makes the oil liquid at room temperature, and extends the product’s shelf life. There are three basic types of fatty acids—short-chain, medium-chain, and long-chain. Long-chain fatty acids have more carbon atoms, which means they require higher temperatures to melt. 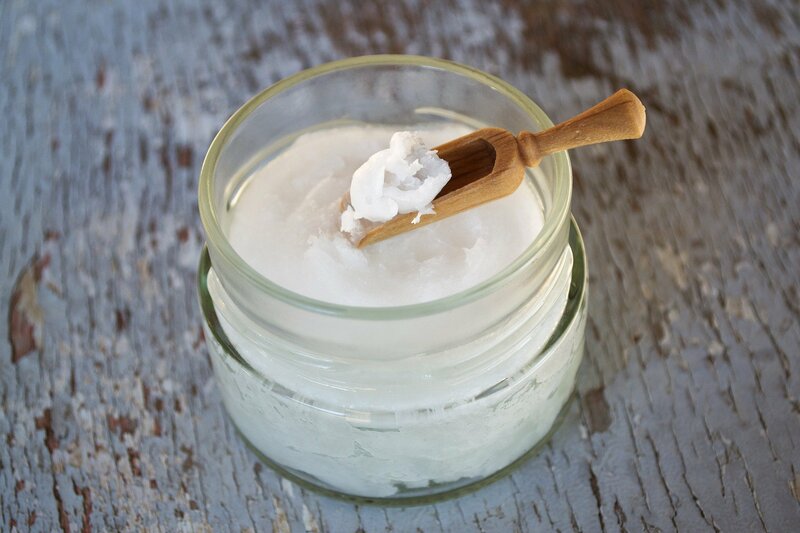 Fats that are solid at room temperature have longer chain lengths—thus, coconut oil. how does it become liquid? One of the fatty acids that’s mostly removed in fractionation is lauric acid—a type of “healthy” saturated fat found in high quantities in coconut and palm kernel oils. It’s a great fat to have in skin care because it’s so moisturizing and cleansing. Removing it, though, gives us the liquid product we need to use in items like our Herbal Facial Oils. Once the lauric acid and other long-chain fatty acids are gone, you’re still left with a lot of good stuff, including medium chain fatty acids like capric, caprylic, myristic and palmitic, all of which retain their super-moisturizing capabilities. You also still have the natural antioxidants, which protect from environmental stressors, and nutrients like vitamins A, C, and E, which help maintain a tighter, firmer look. Fractionated coconut oil is completely soluble with other oils, which makes it the perfect carrier oil, capable of ushering other oils into the skin. It’s also extremely light, and absorbs quickly into the skin without clogging pores. You’re left with a soft, smooth feeling that won’t exacerbate oiliness or leave you feeling greasy. You can get the full benefits of extra virgin coconut oil in our Coconut Honey Mask and in our Coconut Body Oil, where the buttery consistency is desired. Then you can enjoy the light moisturizing and deeply penetrating benefits of the coconut oil in our Herbal Facial Oils, without having to worry about greasiness or clogged pores. In other words, we’ve got the benefits of coconut oil here for all skin types, so no one has to go without! How do you use coconut oil in your skin care? What type do you use? Share with us in the comments! Nazimah Hamid, “Antioxidant capacity of phenolic acids of virgin coconut oil,” International Journal of Food Sciences and Nutrition, January 2009; 60(Suppl 2):114-23, http://www.researchgate.net/publication/23712333_Antioxidant_capacity_and_phenolic_acids_of_virgin_coconut_oil. If I have no problem with oily skin, can I just use the virgin coconut oil instead of the fractionated in this recipe? Thank you. I wanted to make a liquid hand soap..but the recipe calls for fractionated coconut oil. Can I just melt the coconut oil for the recipe? Nice article, although one thing was not quite correct- the tendency of oils to be solid at room temperature is derived more from the “saturation” (number of hydrogens) on their carbon chains than the actual length of the chains themselves. Unsaturated fatty acids are more likely to be liquid at room temp than saturated fatty acids, regardless of chain length. As an example, olive oil is full of long chain fatty acids but remains liquid because they are largely unsaturated. I really appreciate reading this. It gives me all the information I need to use the oil for everything I planned on using it for. So let me be clear. You are saying if someone has acne prone or oily skin, they should use Fractionated oil and those with dry skin can use Extra Virgin coconut oil? How are we going to pick and know which one is Fractionated and Non Franctionated coconut oils in the market? The label will say whether the coconut oil you’re purchasing is Extra Virgin or fractionated. I’d like to know how is subtracted the fatty acid from the virgin coconut oil for your products? Typically, fractionated coconut oil is created by using a centrifuge. This isn’t something that we create, but we do extensive vetting and trust our ingredient vendors to make sure that they are using safe methods to process and create our ingredients. We have had to edit our content to be compliant with the FDA so some thing aren’t listed in full. We don’t suggest Extra Virgin Coconut Oil for people that experience oily skin and clogged pores, but fractionated coconut oil is great. I like this information about the difference extra virgin and fractional coconut oil. Because I also use the extra virgin coconut oil. So I found the its benefits article. Your article is very helpful to me.Thanks for sharing this information. Thanks for the article. It explains really well the differences between the different oils, including processing and application! My friend Jo got me hooked on cooking eggs in coconut oil. They do taste a little bit like coconut, but that’s a good thing to me. I also add a tablespoon to my green smoothies and sauté vegetables with it.Occasionally,time to time i use coconut oil for daily routine for getting benefits. I use it for baking, moisturizer, cooking etc. I religiously use all of these things of coconut and can personally say they work for me, and hopefully for you!Thanks for sharing. There is actually no such thing as “extra virgin” coconut oil. This is simply a marketing term. You say the fractionated oil is created by hydrolysis. How is this hydrolysis performed? I’m assuming that water is used? If so, what kind of water is used? Is it distilled? Thanks! Hydrolysis and steam distillation are water-based processes. We do not have the information on the type of water used in the process because we do not perform the process ourselves but we trust our vendors 100% to use clean, safe ingredients and processes. I am wonder to see difference between Extra Virgin and Fractionated Coconut Oil.This oil is too beneficial included huge uses. I am glad to use this oil.Thanks for sharing. I’m trying to make a non oily/grease lotion that doesn’t have to be refrigerated (coconut milk). Is the fractionated coconut oil non oily? I’ve never tried it. Both extra virgin & fractionated coconut oil are “oily” however they don’t stay that way for long. Both absorb into the skin fairly quick, leaving you with smooth soft skin that feels hydrated, not slick. I love it too because I can get dressed immediately after oiling myself and don’t worry that the oil is going to stain my clothes. It even dries without leaving an oil mark if it does get on your clothes. Coconut oil is even used to to treat stains in certain applications,so it makes sense. I absolutely love both forms. I think coconut oil has one of the greatest point that it has made from coconut.A coconut give us protein to our skin and hairs also.According to me if once you apply this oil on your hairs then you will feel cool & stay away for some time from any burden or problem.you have given more knowledge about this.I appreciate your products.Can you tell me its cost? So, if we want to use coconut oil as a makeup remover, does it matter whether it’s fractionated or not? I would personally go for the fractionated since it is a liquid and less likely than regular coconut oil to cause breakouts. However if you don’t have any issues with acne (I stay away from coconut oil because it’s highly comedogenic) and have very dry skin exta virgin coconut oil would be ok. Just have to melt between your hands first. I love coconut oil the more I use it ! Thanks so much for clarifying the question above, which I agree is a great question! Also, thanks for posting so much great information! It’s good to know the whys of the different ingredients and when it comes to watching out for our own health, this type of knowledge is invaluable!! I so love your products! They are wonderful! You refer to your coconut body oil, and same product: coconut body & FACE oil. Per this article, it states that the extra virgin oil would clog pores. Why label this as a FACE oil? It seems like it is less than ideal for face usage. Please clarify if I am misunderstanding this.